Home All About Cats Cat Information What are the Causes of Odd-Eyed Cats? You must have wondered why there are odd-eyed cats and what causes this condition in cats. Actually a cat with an odd eye is a white colored cat with one blue color eye and the other eye is yellow, green or brown. Seems strange, but what are the reasons that results in odd eyed cats. Let us understand in detail what causes this condition in cats. Melanin is the main factor that gives color to the eye. It is an important pigment that is present in the skin, hair and eyes of animals. It is a brown or black colored pigment. The eyes that are brown in color are rich in melanin a pigment that gives the color while the eyes that are blue indicate deficiency of melanin pigment. This is a rare phenomenon and you would not easily find such cats. Actually all kittens are born with blue eyes and as they grow older the melanin changes the color of the eyes to yellow, green, orange or copper. This usually happens in one eye only and is found more in white cats since they do not have pigmentation due to one specific gene. Why do White colored cats have odd eyes? Non-white cats rarely have odd eyes, but that doesn’t mean they do not have odd eyes. Odd colored eyes are caused due to the white gene that interfere with melanin and the way it gets absorbed by the eyes. 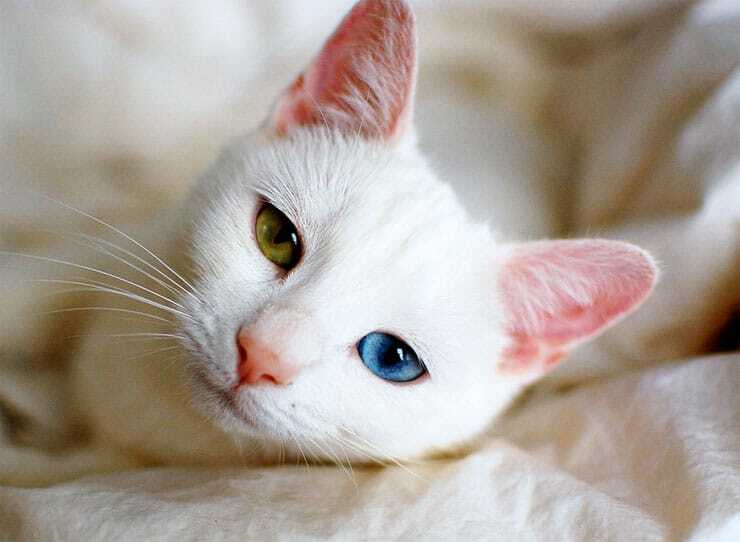 There are several reasons for white cats to have blue color eyes. If the underlying coat pattern is of a pointed cat also referred to as Siamese pattern, the blue eyes can come from the genes of the pointed cat gene. It is also said that odd eyed cats have difficulty hearing and to some extent it is true. There is a link between the coat of the cat, blue eyes and deafness. White cats with blue colored eyes are deaf and more than 50percent odd-eyed cats suffer from this problem. The deafness in these cats is more likely to influence the ear on the blue eyed side. A detailed study was conducted in the year 1997 of white cats with varying degree of deafness and it was found that more than 70% cats were suffering from deafness. Their entire inner ear wall was degenerated within the initial few weeks of birth. Cats with odd eyes are born because of a prevailing white gene, which prevents any other color genes and turns the cat into white. This gene is responsible for preventing the melanin an important pigment from changing one eye during the growing up years. This results in the cat having one blue colored eye and the other green color, yellow color or brown colored eye. Some cats have white spotted genes and these genes are responsible for tuxedo or bicolored cats. This condition is not found in cats that are short of the dominant white gene. Kittens with odd eyes have a different variation of blue in their eyes. The shade of the odd eye changes until they reach adulthood and acquires the final color that adult cats have. The Japanese Bobtail cats have often displayed odd color eyes in both white as well as calico colors. These odd eyed cats are prized possessions and are very much in demand due to their uniqueness. The other remarkable feature that is noticed in odd-eyed cats is that when a photo is taken with a flash the blue eyes of these cats create a red eye effect while the other eye remains the same. Odd eyed cats can be seen in various popular cat breeds like the Turkish Van cat, Angora cat, Sphynx, Oriental Shorthair, Persian, and the Khao Manee. In Turkey a breeding program is conducted to protect the white Angora cat breed that has blue and amber colored eyes. This breed is considered a state treasure in Turkey. If you notice your mature cat suddenly developing this condition, then it is a real cause for concern. It may be due to an accumulation of iron or blood in the back chambers of the eye. Inflammation may also be a reason for this condition. If you notice sudden change in your cat’s eyes, then it is a perfect situation to consult a vet.